What is the one-for-one business model? Blake Mycoskie, TOMS Shoes‘ founder, came up with the one-for-one business model. When traveling in Argentina, he noticed poor kids grew up without shoes. He decided that for each pair of shoes sold, the company would donate a pair back to them. The one-for-one model innovated in comparison to traditional business models. Why is the one-for-one business model effective? By leveraging on a compelling value proposition (for each product bought, one gets donated) a company can leverage on the word of mouth, enthusiasm and social networks effects of aware consumers. 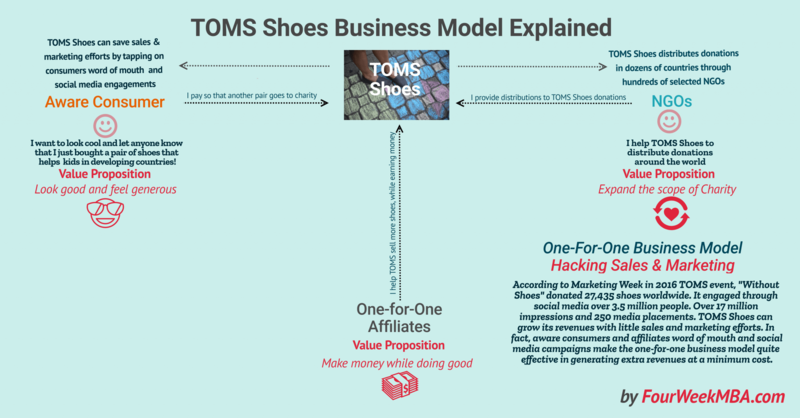 In fact, the one-for-one business model proved quite effective for TOMS Shoes that with a minimum effort regarding marketing and sales has been able to generate hundreds of millions in net sales in 2017. Previous Previous post: What is a peer to peer business model? Next Next post: What is a passive income business model?